In a video that went viral, Mohammed, who was apparently addressing some journalists, said he was giving the information in an off-the-record basis, to serve as a background to their reports.He said it was wrong to compare what was happening to El-Zakzaky, whose followers have been confronting security agents since his incarceration, with what befell the late leader Boko Haram leader, Mohammed Yusuf.He said the IMN leader was undergoing criminal prosecution in Kaduna State and that the court had denied him bail. He explained that instead of detaining him in a prison, the Federal Government decided to hold El-Zakzaky in a building belonging to the Department of State Services. The cleric eats whatever he likes in detention, he said, noting: "It costs the government about N3.5m every month to feed him." 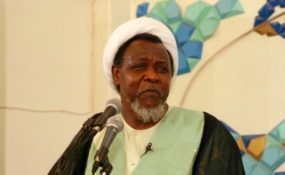 Mohammed claimed he got the figure from relevant government agencies, describing the IMN issue as "sensitive. "The television station that released the clip has since apologised to the minister. But human rights activist, Femi Falana, criticised Mohammed's disclosure, saying: "It is money poured down the drain." He added: "Since the army had demolished their house the court ordered that a house be provided for them. A government that has brazenly disregarded these valid and subsisting orders of a competent court is now insulting the collective intelligence of Nigerians by claiming that it is spending N3.5 million to feed the couple in the illegal custody of the DSS." The senator representing Bayelsa East senatorial district in the National Assembly, Ben Murray-Bruce, took to Twitter, saying: "If President Muhammadu Buhari can afford N3.5m per month to feed El-Zakzaky, then I don't see why he can't afford N30,000 per month to pay the new minimum wage. Or should Nigerian workers join El-Zakzaky in detention, so they can feed at N116,000 a day too?" He spoke yesterday while addressing the 73rd Session of the Executive Committee and 41st Conference of Speakers of National Parliaments of the African Parliamentary Union held in Abuja. Buhari said Nigeria, on its part, had done a lot to reverse the terror trend and halt the advancement of Boko Haram in collaboration with neighbouring countries. According to him, such collaboration has strengthened the nations' armed forces and spawned programmes that address widespread poverty. But in spite of the progress, Buhari noted: "We are not unmindful of the remaining challenge of armed invaders who ransack villages and small farming communities and commit terrible acts including cold-blooded murder of women and children. "He expressed delight at the focus by the APU Panel of Women Parliamentarians towards promoting girls' education to address the menace of early marriage. Nigeria and others are ready to consider all input on the subject with a view to improving the condition of the African girl-child, he assured. In his words: "Educating girls increases the probability of having more women innovators, entrepreneurs and chief executive officers."